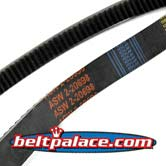 ASW 2-20698 Belt. American Sportworks, LandMaster 2-20698. CVTech Belt - 650. 20698. 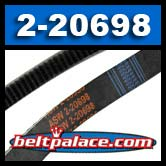 Replaces ASW belt of same number on many Land Pride, Land Master, and other mass produced UTV's. This is a proprietary belt. No other specifications are available. Comet Industries Belt 300659C, 300659 (Obsolete). Replacement Bristers Chuckwagon CW650 belt (653cc Subaru after serial# 41801) w/ CVTech Clutches.